Crowds cheered and applauded as rebelling Honduran police officers poured into headquarters in the capital city Tegucigalpa, saying they would refuse to take orders until the political crisis sparked by allegations of fraud in the recent presidential election is resolved. The elite U.S.-backed COBRAS police unit launched the rebellion Monday citing onerous working conditions that have kept them away from their families since before election day and a electoral debacle that should be sorted out at a political level, not in clashes between police and citizens in the street. 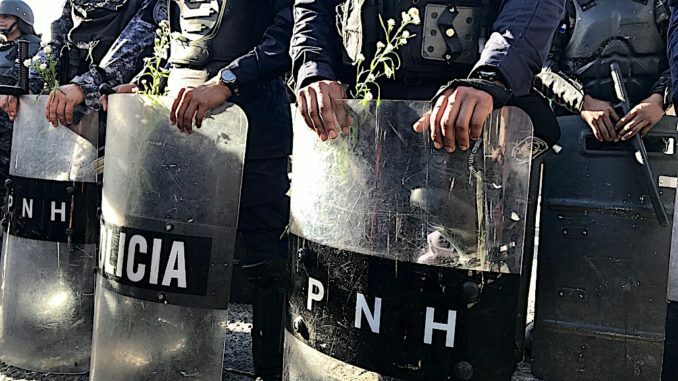 “The reason for our position is we cannot repress the people,” one masked COBRAS officer told Upside Down World Monday afternoon at the police headquarters in Tegucigalpa. “This isn’t a political issue, but yes we are with the people because it is unjust what is happening.” ?? Within hours, scores of police from other units joined the rebellion, streaming into headquarters by the truckload and vowing to stay off the streets until Honduras officially has a new president. COBRAS officers on the scene said the rebellion was not a strike, stressing that they wanted peace for Honduras. They said they would refuse to enforce the dusk-to-dawn curfew imposed Friday. The government declared the state of siege to quell demonstrations and break up protest blockades that swept the country last week demanding transparent election results amid growing tensions and cries of fraud. In a statement, police called for a complete vote-by-vote recount to ensure that the will of the Honduran people expressed at the polls is respected. “We are not politicized by any particular political party, rather what we ask is that they respect our rights as human beings,” another masked COBRAS officer told Upside Down World. 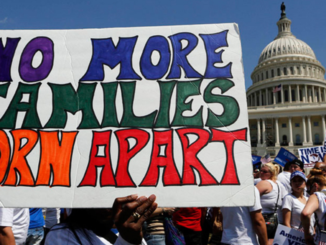 “We have families. We’re not machines. We get tired. We have been working day and night for 16 days. We need this to be resolved once and for all,” he added. 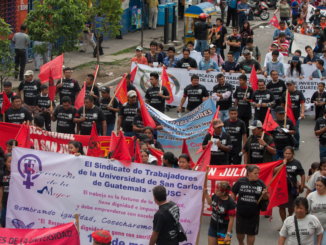 “What we demand is that in Honduras there be peace. That this problem be resolved. And that there not be death or blood on Honduran territory,” the officer concluded. Tensions fuelled by uncertainty and frustration as the TSE repeated delayed the release of results over the past week have spilled over into violence. Police and military crackdowns on protesters and brutal military enforcement of the curfew have caused deaths and dozens of injuries. The Inter-American Human Rights Commission and United Nations human rights office reported Monday that they have received preliminary information on the deaths of 11 people since the crisis broke out. Police said four officers in their ranks have been killed in recent days, further spurring their rebellion. Over one week after Hondurans cast their votes, the Supreme Electoral Tribunal (TSE) still has not officially announced a winner in the presidential race. With 99.98 percent of ballots counted, TSE results show a lead for Hernandez with 42.98 over opposition candidate Salvador Nasralla with 41.38 percent, a difference of 52,595 votes. Prolonged silences from the TSE and a sharp shift from a 5 percent lead for Nasralla to a projected win for Hernandez, among other irregularities, have fuelled widespread allegations of vote tampering. 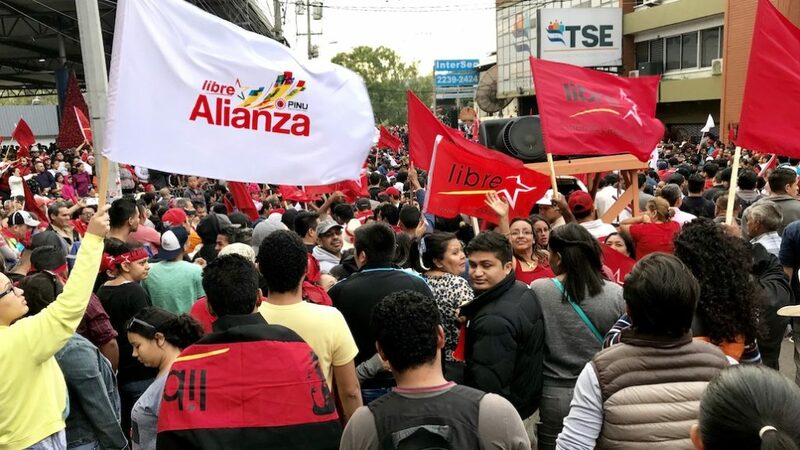 Calls from the left-right Opposition Alliance Against the Dictatorship, headed by Nasralla, for a recount have recently garnered support from international observers who also cast doubt on the official results. ? 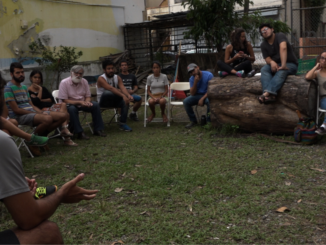 “The situation has boiled over, caused by the Supreme Electoral Tribunal,” human rights defender Sandra Zambrano told Upside Down World at the police headquarters as COBRAS police officers began their rebellion. Over the past week, COBRAS have been in the lines of riot police guarding the entrance to the area where votes are being counted in Tegucigalpa. They were among the security forces that cracked down on demonstrators with tear gas to disperse protests. 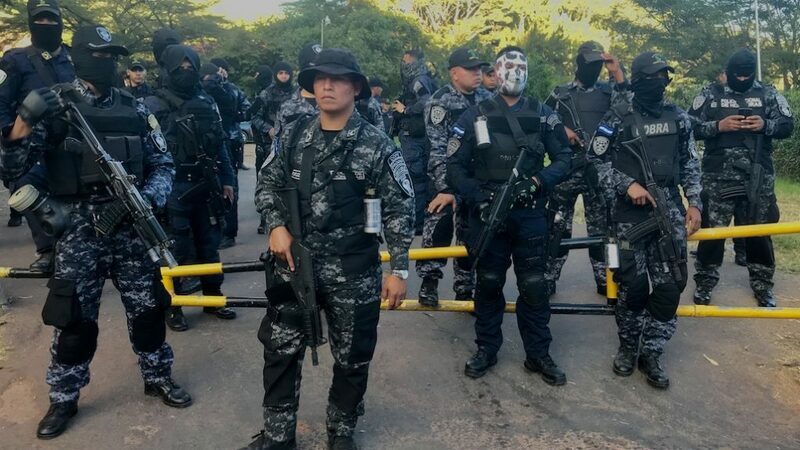 Zambrano added that the hybrid military police force, created in 2013 under Hernandez’s National Party predecessor Porfirio Lobo, have been accused in recent days of being behind the most brutal abuses. The first fatal victim reported as a result of the curfew, Kimberly Dayana Fonseca, was killed by military police, according to witness testimonies. Hernandez supported the creation of the military police in 2013 as head of Congress and has since strongly advocated for continuing military presence in the streets to carry out domestic police functions. The president has also spearheaded the creation of other militarized forces, including the TIGRES, which also joined the COBRAS in rebelling. Human rights defender Bertha Oliva, director of the Honduran human rights organization COFADEH, recently told Upside Down World that the militarization of security forces in recent years, promoted in the name of increasing security, has sparked new human rights concerns in the wake of the 2009 U.S.-backed military coup. “Now we can confirm why this was done, in order to attack those protesting and suffering rights violations, and right now that’s the majority,” she added. The police also called in a statement on the armed forces to “assume its constitutional role,” suggesting soldiers should consider joining their rebellion. 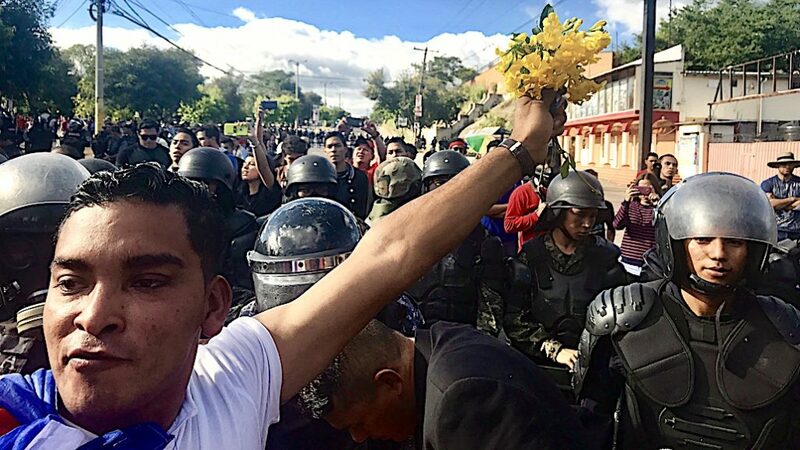 Honduran police and military forces have been accused of widespread human rights violations in recent years, including extrajudicial killings and torture. Initiatives to purge the police force have repeatedly failed to deliver results. Efforts in U.S. Congress to pressure Washington to defund corrupt and human rights-abusing Honduran security forces, particularly since the murder of internationally-renowned Honduran Indigenous leader Berta Cáceres last year, have also stalled. According to the Security Assistance Monitor, Honduras has received over $114 million in security aid since 2009. With police in rebellion, military forces will now be even more central in enforcing the curfew, which changed Monday from a 6pm to 6am suspension of constitutional rights to 8pm to 5am. Civil rights groups filed an appeal to the Supreme Court Monday arguing that the state of siege is unconstitutional and should be suspended. The implementation of the decree, they maintained, did not follow appropriate channels and is therefore illegal. “Issuing this decree in an illegal way also allowed the military police to violate other constitution rights, such as the right to peaceful protest,” Kenia Oliva of the freedom of expression organization C-Libre told Upside Down World at the Supreme Court Monday, adding that the Supreme Court has 24 hours to respond to the appeal. “If the court doesn’t (suspend the curfew) then it too will fail to fulfill the law and have criminal responsibility for rights violations and for not fulfilling what the law requires of them,” she added. On Monday night, Hondurans in many parts of the capital city defied the curfew by taking their “cacerolazo” noise-making protests to the streets in neighborhood gatherings. Sounds of horns, music, anti-Hernandez chants, and deafening banging of pots and pans have filled the night sky for three night in a row as Hondurans are determined to make their voices heard despite the curfew. Meanwhile, over one week after election day, Hondurans still have no definitive answer from the TSE who the next president of the country will be. The Opposition Alliance has accused the government-run TSE, headed by David Matamoros, an active member of the National Party, of attempting to steal the election and demanded the elections body agree to conditions it says will help ensure transparency of the results. The TSE completed the count with a vote-by-vote tally of the last 6 percent of ballots. The Opposition Alliance boycotted the process, arguing that a more complete recount was necessary. Nasralla has vowed not to accept the results if the TSE declares Hernandez the winner. Matamoros has said the TSE will not officially announce the winner until it completes the count for the other levels of government. Results on its website show Hernandez is ahead by over 1.5 percent. The Opposition Alliance alleged that the TSE hatched fraud during hours-long silences that interrupted the release of results throughout last week. The Opposition Alliance claims that fake vote tallies were filled out after polls closed to replace the original tally sheets, inflating Hernandez’s numbers and docking votes from Nasralla. They demand a recount of the 5,179 vote tallies — out of a total 18,128 — that were scanned in Tegucigalpa at the vote counting location and not sent electronically from polling locations. The calls for a more complete recount have gotten a boost in recent days. In addition to the police calling for a complete vote-by-vote review, the Organization of American States and the European Union election observation missions have both said that the opposition demand for a recount of over 5,000 ballot boxes is reasonable and should be answered. TSE magistrate Ramiro Lobo has also said that the request for a partial recount is valid. He also called for an investigation into the technical problems that caused the TSE system to go down, pointing out that the change in the trend in results coincided with the outage. It remains unclear when the TSE will make an official announcement on the winner of the election.